Good News ! 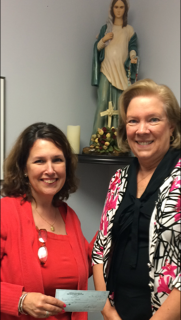 Book Fair founder Lizette Lantigua, left, hands a $ 300 donation to Joan Crown, archdiocesan director of Respect Life. HOLLYWOOD | Good News! Book Fair’s participation in the recent statewide Respect Life Conference has yielded a $300 donation to the Archdiocese of Miami’s Respect Life ministry. The local company was an exhibitor at the 31st annual Florida State Respect Life Conference, held Oct. 20-21 in Weston, and donated a portion of their book sales that weekend to respect life.“Our goal is to inspire the minds and souls of children and teens through books, by making an impact in children’s lives from the very beginning,” said Lizette Lantigua, president of Good News! Book Fair and a parishioner at St. Mark Church in Southwest Ranches. “We urge others this Christmas season to donate to their Respect Life offices, so they can help couples and their babies.” Lantigua presented the donation to Joan Crown, archdiocesan director of Respect Life, during a recent visit and tour of the ministry’s Hollywood offices. “Education of the sanctity of all human life from conception to natural death must begin early. Teaching our children to respect and care for one another will translate later in life to a society of people with generous hearts ready to give of themselves for the sake of others,” said Joan Crown, archdiocesan director of Respect Life.